Atlus has confirmed that Etrian Odyssey Untold: The Millennium Girl will arrive in North America later this year. The Etrian Odyssey franchise exists in a weird space that blends really, really ancient roleplaying game tropes with modern accoutrements. It's an odd niche for the series to occupy, but it seems to have paid off for publisher Atlus. Despite being less-than-well-known, the Etrian Odyssey games have proven a hit and as a result we won't be waiting much longer for the next entry in the franchise. Dubbed Etrian Odyssey Untold: The Millennium Girl, the new game is actually two games in one. Not only does Millennium Girl include a remastered version of the original Etrian Odyssey, but it also offers a new adventure in which players "journey to unravel the mystery of the Yggdrasil Tree's origins." Both titles feature all of the Nintendo 3DS gimmicks found in Etrian Odyssey 4, including 3D graphics and StreetPass functionality. The biggest addition to Etrian Odyssey Untold: The Millenium Girl is the story mode - a first for the series. The story mode gives players five pre-made characters, each with their own personalities and dialogue to explore a side of Etria not seen in the first game. Adventurers must brave new dungeon layouts, floors and enemies to find out the truth behind the Yggdrasil Tree, and the mysterious girl, Frederica. Also new to the series is the Grimoire Stone system, available in both modes. 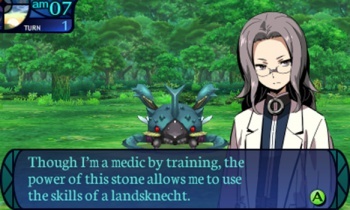 In previous Etrian Odyssey games, skills were set to specific classes, but by collecting, synthesizing, and equipping Grimoire Stones, players can hybridize their party to excel in combat. With the right Grimoire Stones, combatants can even learn powerful enemy skills. Individual personalities and dialogue? That's unexpected, and a bit worrying. That places a big impetus on Atlus' localization team to make sure the game's dialogue is top-notch, lest it get repetitive or just shoddy. Atlus generally employs some of the best translators in the business, but I'm still not entirely sold on this idea. Then again, I was going to get this game anyway. If you can get into the Etrian Odyssey games, and appreciate them for what they are, there are few series as life-destroyingly addictive. As for when we might see this game on retail shelves, that remains up in the air. Atlus has offered a "Fall 2013" release window, but no specificity beyond that. We'll bring you more as soon as the company decides to be less coy.